I was thinking of making a sumac leather to use up my last batch of sumac juice. Then I remembered something very similar, something like a fruit leather covering walnuts linked on a string. With no idea what it was called, nor where it originated, I wasn’t sure how to find anything about it. I just knew that it is eaten in places like Greece and Russia. Actually, I needed only describe it and do a google search, and there it is. But I was reading Anya von Bremzen’s “Mastering the Art of Soviet Cooking” and she mentioned eating this in the Republic of Georgia, where according to Wikipedia, it originated. It is also made in many other countries in that general region, such as Greece and Turkey. The Georgian and Russian name for it is churchkhela. It is not often available commercially. It is made in people’s kitchens, and sometimes sold at farmers markets, hanging in bunches much like hand dipped candles. 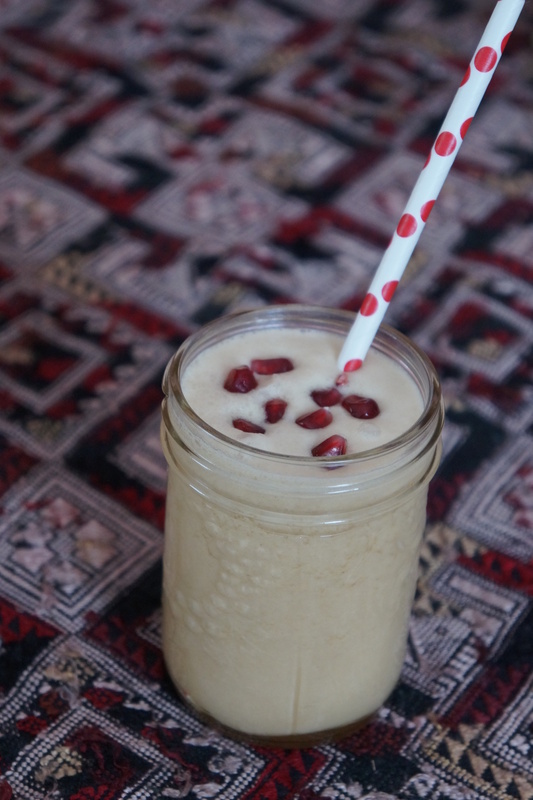 It can be made with other fruits besides grape, so it seemed reasonable to use sumac, although you could use apple cider, berry juices, quince, and so on. I really like to recreate interesting recipes I have discovered in far-away places, and make any changes necessary to achieve a similar result in this part of the world. And churchkhela, even if I didn’t know the word before, is one of those recipes. I had to make a few minor changes. Traditionally the nuts are dipped in a thickened juice and then hung to dry in the sun. No chance of that here right now, or maybe ever. So with nowhere to allow the strings to drip and dry, I decided to forego the string and just dip the individual walnuts. Instead of sun, I used a dehydrator, and did some partially in the oven with the electric light on. In either case, it is at a temperature of about 40-50 degrees Celsius. Cover the walnuts and soak in water for a couple of hours. This step is really to make it easier to string the nuts and prevent them for cracking, but I recommend it even if not using string. It makes for a softer texture which goes with the coating, and I think prevents them from drying out too much during the process. Mix a little fruit juice with the starch and then add to the rest of the juice in a saucepan. Add the sugar, and heat until it starts to bubble and loses the milky colour. Allow to cool. Dip the drained walnuts (reserve the water for soup stock) in the syrup and place on the dehydrator tray, or on parchment if you are doing it in the oven. 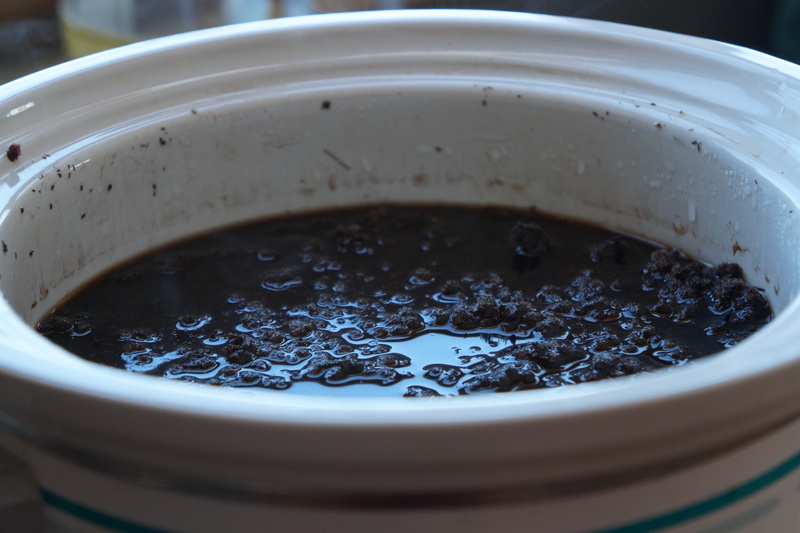 The first layer was dried only a couple of hours at a low temperature (about 40 degrees C). The second coating was left about 4 hours, and after that about 10 hours, until they are not sticky to the touch, similar to licorice. I did some three times, some four times, and had I had more sumac juice, could have kept going for a thicker coating, although that would have taken a lot longer. They are very tasty as they are, and remarkably like the real thing I bought from the experts. I hope, if nothing else, this contribution to The Novice Gardener’s Fiesta Friday gives you some idea of how this traditional Georgian churchkhela can be adapted and enjoyed without the need to travel half way across the world. Categories: snacks, wild fruit | Tags: churchkhela, Fiesta Friday, foraging, locavore, Republic of Georgia, sumac, walnuts, wild fruit | Permalink. Last Sunday it was a balmy -3 C, and for me the first opportunity of the year to get out and do some foraging. It just goes to show that even in this challenging climate, there is always something out there for the foraging enthusiast. 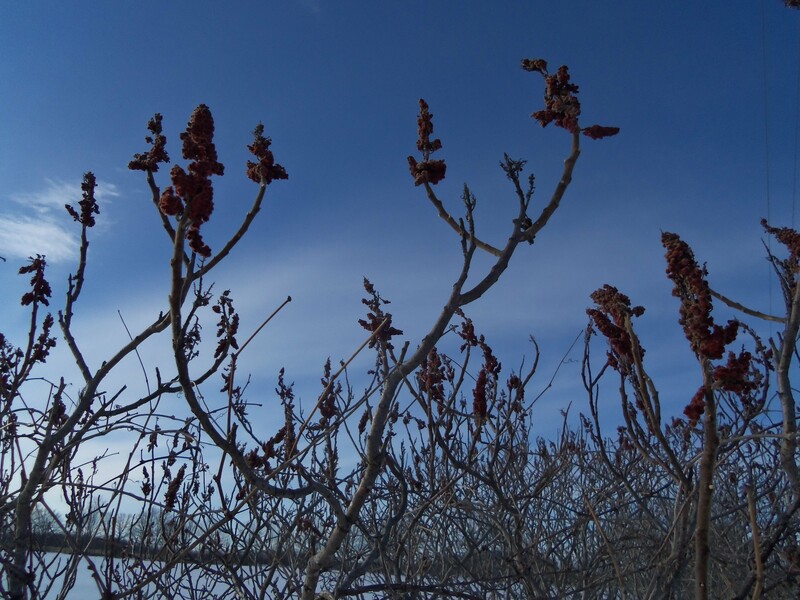 Apart from having to negotiate the deep snow banks, I found this to be an ideal time to pick sumac. The flowers just snapped off, and the berries likewise were much easier to remove from the stems than they had been in the summer. In just a few minutes, I had a full bag of flowers, and the bushes still looked untouched. I started by making a sumac syrup, this time cooking it for longer than in my previous experiments. I filled a crock pot about 3/4 full, poured water until the mixture reached the brim, and then cooked it on low for 12 hours. Then I strained the deep red juice through a coffee filter to be used in some new recipes. Here it is after 12 hours of stewing. The first is for a sumac meringue pie, which I present to The Novice Gardener’s Fiesta Friday for this week. Since my theory that sumac is the new lemon, it can replace the imported fruit just about anywhere, and what better place to begin than with a festive pie. To make the syrup: Measure off 4 cups of juice, add 1 cup of sugar and simmer until you have about 2 1/2 cups of syrup. 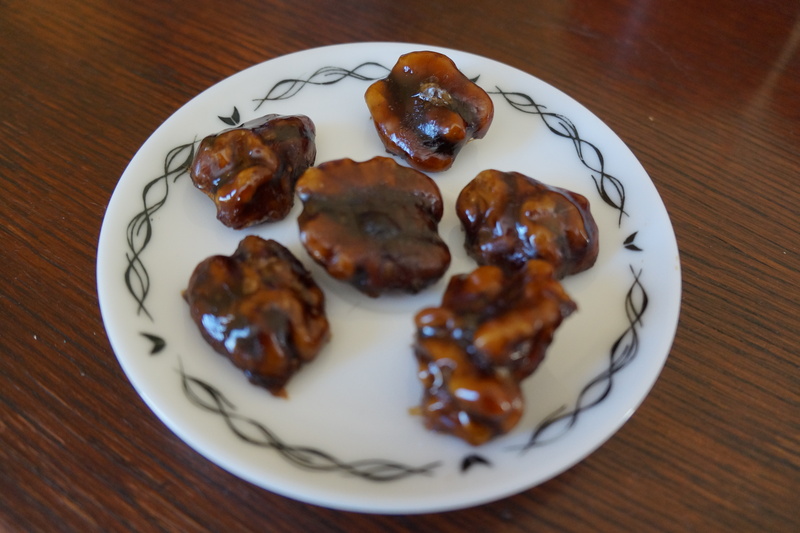 Pastry: I used a recipe from La Petite Paniere, the one she uses for Tarte Tatin (which by the way I highly recommend) because I did not want a flaky, lard pastry but rather a buttery French style one. 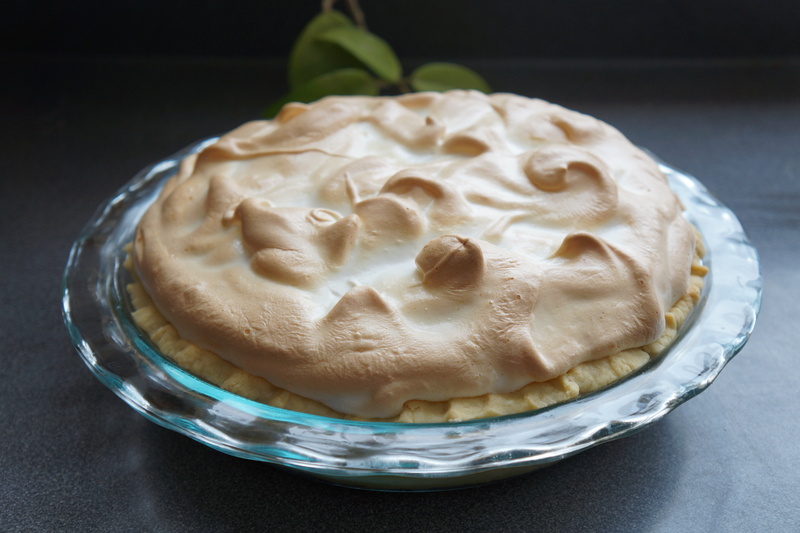 Or use your own favourite recipe for a meringue pie. Mix the starch together with the syrup until it thickens. Spoon some of the hot liquid into the beaten yolks and then add the egg yolk mixture into the syrup pot. Continue to cook and stir for a couple of minutes. Beat the egg whites. When stiff, add the sugar and cream of tartar and continue to beat until peaks form. Pour the custard into a baked pie shell. 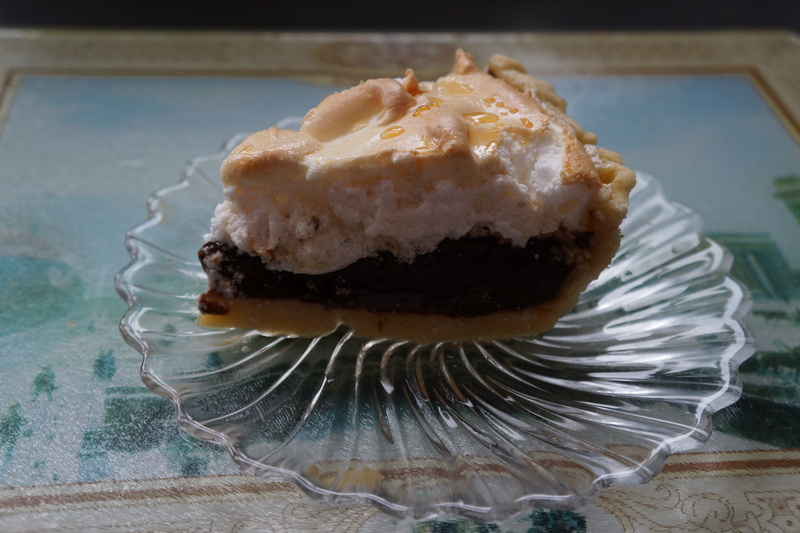 Top with meringue and bake in a 350 oven until the meringue is golden on top. Allow to cool before cutting. This pie is not only local and organic, at least the sumac part, but also requires a lot less sugar than a lemon version. I hope this sumac meringue pie will help persuade the skeptics that even invasive weeds are sometimes worth considering as a valuable source of great food. Categories: baking, dessert, edible weeds, wild fruit | Tags: cake-desserts-sweets, dessert, Fiesta Friday, foraging, lemon substitute, sumac, sumac meringue pie, winter foraging | Permalink. It’s another Fiesta Friday with The Novice Gardener, and although it has been a busy week with so many Olympic events to watch, I have managed to contribute some bar fare. After all, this is one party for which I don’t have to be the designated driver. These recipes are, as often, not really recipes, but simply ideas of how to use the ingredients I have stored in the pantry/freezer/bar which this blog is all about – wild edibles. It is all very well to know what is edible, how to identify it, and maybe even why it is good for you, but it is just as important to know what can be done with it once you have it. Anyone who has been reading this blog from last summer might remember that I made fruit cordials, all of them sugar and fruit in a 1:1 ratio, soaked in vodka for a few weeks, then strained and bottled. The fruits I used were grapes, crab apples and high bush cranberries. I also made some spruce infused vodka for which there is already one recipe posted. I have been enjoying all these since December, but luckily have not consumed them all yet. I am not usually one for sweet or mixed drinks, but recently have enjoyed the odd cocktail in restaurants which has inspired me to try out some of my own formulas. I have limited myself to what I already have – no special purchases. I think this helps with originality as well as cost. I encourage you to do the same, and let me know what you come up with. If the amount consumed is any indication, then the grape cordial is my favourite. The amount of sugar is right on – it is dry, but not at all sour. It makes a great little digestif all by itself, so I offer this with no frills – just straight up grape cordial. 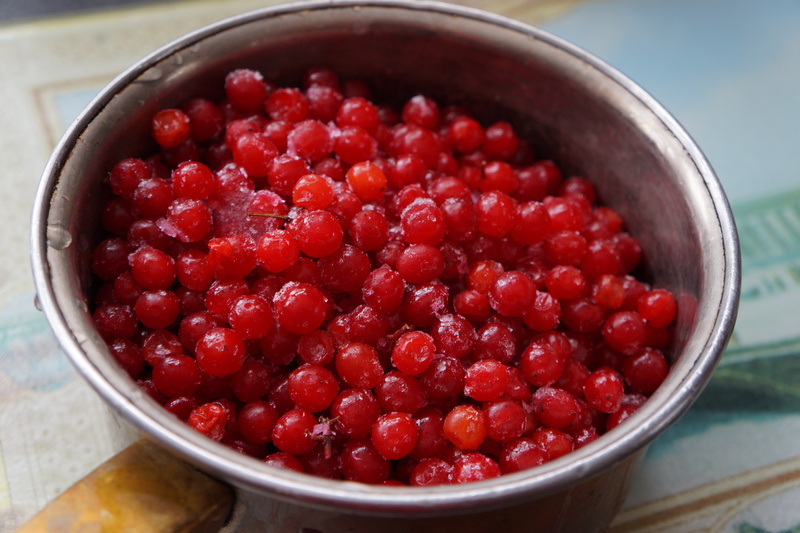 The high bush cranberry has a very strong flavour on its own, and even with all that sugar is not sweet. It does benefit from mixing it with something to lighten, but not extinguish the flavour. Mix everything in a blender and strain into a glass. 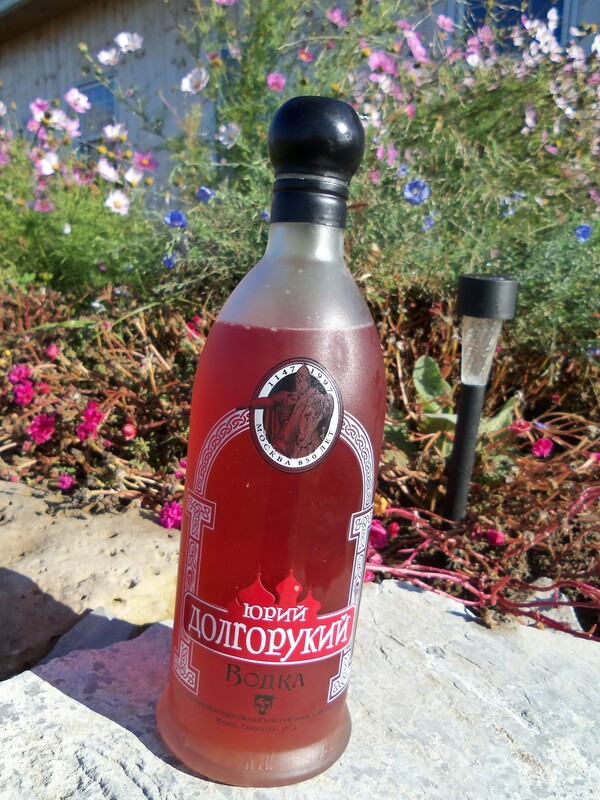 The crab apple infused vodka has a wonderful apple flavour, but is a little sweet for my taste. Next time, a little less sugar. The flavour goes a long way, so it is possible to dilute it without losing its flavour. In this one, I just added a small can of ginger ale to 1 ounce of cordial and a splash of lemon juice to help cut the sweetness. I think a little ginger would be good too. The spruce infused vodka has a very strong, dry flavour. Not so pleasant on its own. I would call it an essence rather than a cordial. So I used very little and mixed it with sweet and cream, and it was perfect. Especially if like me you enjoy herbal drinks, such as Chartreuse or Fernet, this is a good one. Mix or blend all the ingredients and pour into a glass. So bottoms up to all the guests this week at The Novice Gardener’s Fiesta Friday. I hope you are inspired by the idea of making your own wild cocktails – and I would love to hear any suggestions you may have for names for these concoctions. Categories: alcoholic beverage, drinks, wild fruit | Tags: cocktails, cordials, crab apple, Fiesta Friday, high bush cranberries, mixed drinks, spruce needles, vodka, wild fruit, wild grape | Permalink. 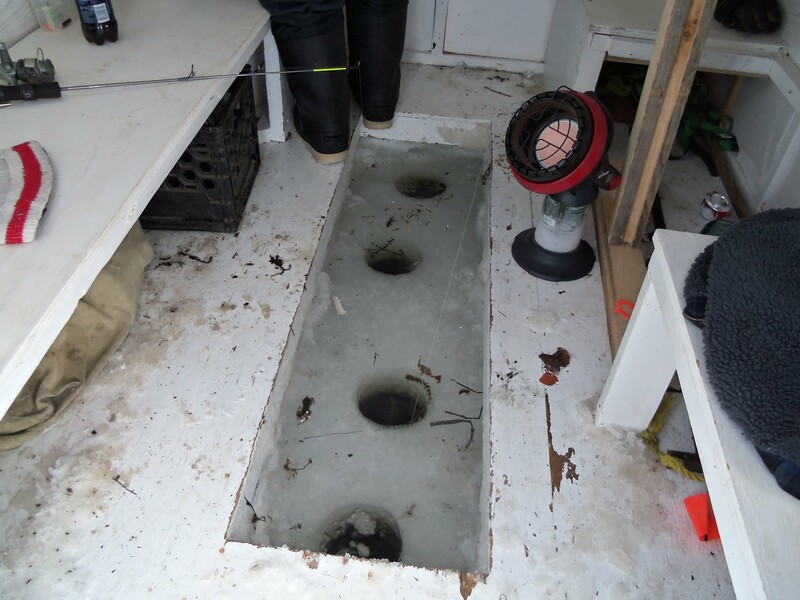 I am thinking of taking up ice fishing. Especially when I am out on a frozen lake and the sun is shining, I think it is the quintessential Canadian winter pass-time and one I might actually be able to do. I think about bringing a lawn chair, a thermos of hot drink, bundling myself up, and then just taking in all the beautiful scenery around. I know there is more to it than that, but these the most important aspects. This is the kind of set-up I have in mind, with chair, and sun. 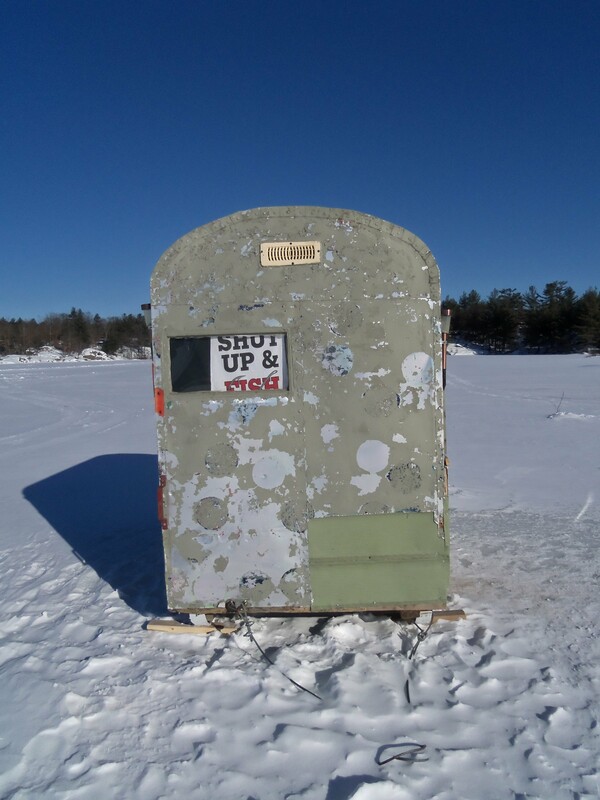 With the idea of doing a little research on the art of ice fishing, this past weekend I dropped by Beaver Lake where The Lakeview Tavern was hosting their annual fishing derby. Beaver Lake is a popular spot for fishing, with several huts planted there for the season every year. Pike and pickerel are the fish most often caught here. I would be interested in foraging for these – from my lawn chair. I interviewed two very kind men who were willing to break the silence by answering my questions. 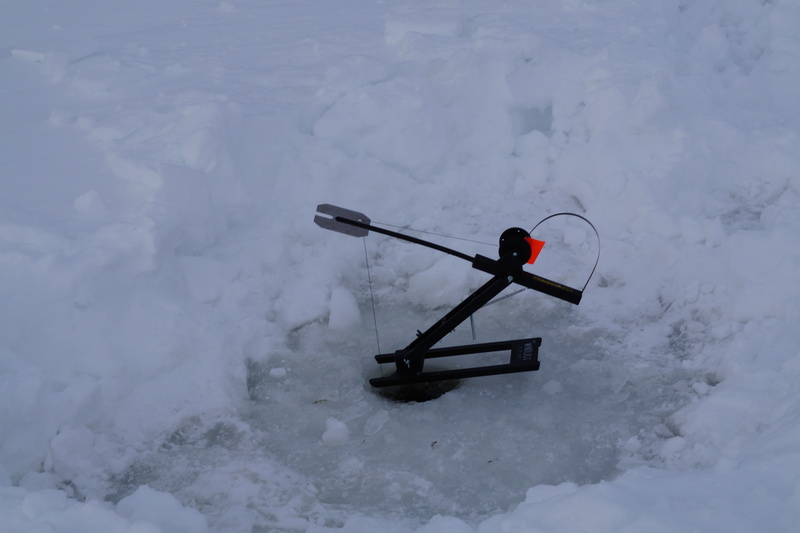 They had several holes and rods, and a lot of patience – for fishing, I mean. I can understand the need for a hut on cold days like the ones we have been experiencing. This one looked very cozy. If the season just holds out long enough for me to get my gear together, I will join the fishing ranks this season. Here is one of the successful participants in the derby with his catch. 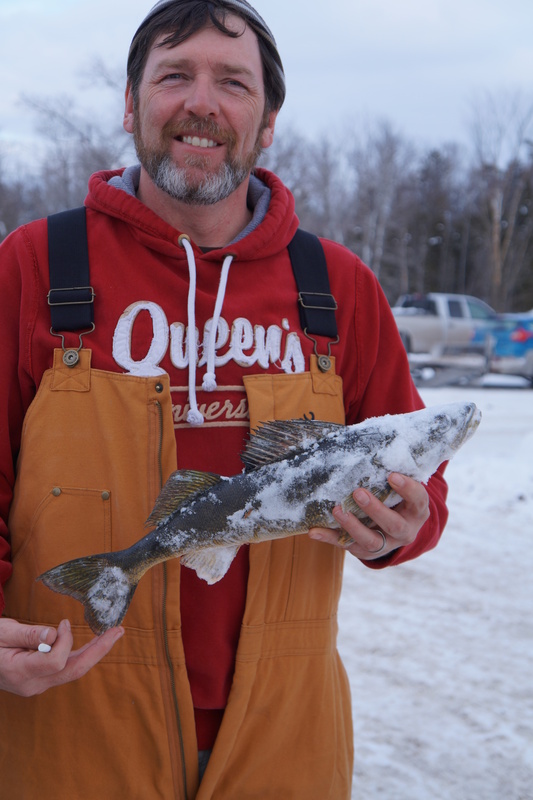 Meanwhile, I do buy local fish when I can, and will post a recipe on cooking pickerel as soon as I get my next lot, by hook or by other method. 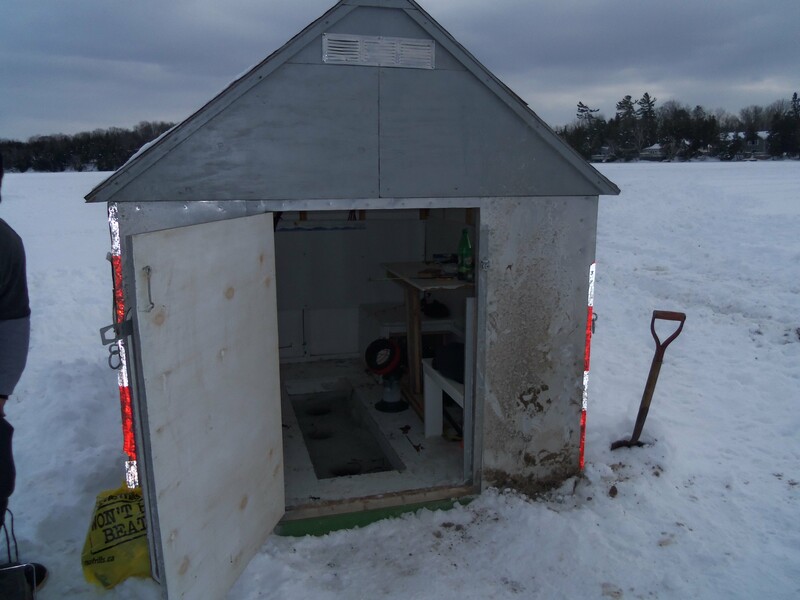 Categories: fish | Tags: Beaver Lake, fishing derby, ice fishing, pickerel, Sheffield Lake | Permalink. It’s the end of the week and that means another Fiesta Friday with The Novice Gardener and her guests. Can’t wait to see what they post this week. My guess is that some will mention snow, or cold. Another event today is the opening of the Olympic Games. And this is my blog’s 50th post – so 3 good reasons to celebrate! Instead of offering something to keep you warm and fight off the winter chills, I have decided to take you out into the snow and have some fun with it. This winter, after all, we are making memories of “that winter with all the snow”. Especially for people too young to have experienced a real winter, this will be talked about for years to come. So let’s enjoy it. I do remember some very snowy past winters of my childhood, when eating snow was just what we did. ‘Safety’ meant looking both ways before you crossed the road – and that was it. When looking up eating snow recipes, I read several which said simply “Do not eat”. Apparently, flakes form around dust particles and goodness knows what else in the atmosphere. However, I did read one which said if it snows a lot, the atmosphere gets cleaned up, and the surface of the fallen snow is relatively clean. I also read quite a few posts where people did add snow to some rather fun recipes, and didn’t worry too much about its safety. After all, who hasn’t tasted snow, or dust for that matter? So, now I have that out of the way, I present some very simple, easy-to-make ‘snow ice cream’ recipes. This can be a great activity for children. It involves mixing one base ingredient (whipped cream, pudding, milk, yogourt, sour cream), some sweetener, and any combination of flavours such as fruit, seeds, nuts, sweets, chocolate, etc. I enjoyed combining ingredients in a way I hadn’t thought of before, and after this exercise I will take some of these ideas and put them to use in real cooking. I was not able to do all the combinations I thought of, as I found my hands getting too cold since I had to assemble everything myself and take pictures. I recommend, if you can do this with others, place all the ingredients on a work surface outside and assemble it there. If you can’t eat it right away, just cover the dishes and stick them in the freezer. My first ‘recipe’ was made with 1 cup of whipped cream, 1 heaping Tbsp thick honey and a teaspoon of lavender infused sugar. It was heavy on the lavender (I made it with the flowers from my garden in the fall), and I feared it would be too strong, but I loved it. Add about 1 cup of snow and mix well. I sprinkled a few lavender petals on top. The next one I made was with chili chocolate made from a powdered drink mix I found in my cupboard. Also 1 cup of cream, chili chocolate to taste and another spoonful of honey. The same amount of snow, and voila! I wanted to make dulce de leche with the evaporated milk, but ended up just using the latter. I simply mixed it with snow, and layered it with sliced banana. By this time, my hands were frozen, so I kept it simple. The next one is a savoury ice cream, inspired by a dessert I had at St. Anselm in New York a while ago. Although it was delicious, I thought the presentation a little sloppy, so I improved on my own by chopping the bacon. It was a blue cheese ice cream with candied bacon and reduced balsamic vinegar. My version consisted of real yogourt (not 2% or fat-free) or you could use sour cream, mixed with a generous chunk of blue cheese. Mix that with the same volume of snow, and sprinkle candied bacon and dribble some reduced balsamic on top. This is fancy dinner party good. To sweeten the bacon I just sprinkled some sugar during the last few seconds of frying. And the final one, also savoury, I could say is in honour of Sochi as a Russian inspired recipe, but really I just had some red caviar to use up, and thought it a pretty colour for a festive dish. This consisted only of yogourt and caviar. I think a small shot of vodka on the side would go well, but not necessary. I did not manage to use any of my coconut milk or several other items I had lined up. But I hope you get the idea. I’m thinking maybe I should put some snow in a plastic bag and keep it in the freezer to make a snow treat on a hot day in July. Categories: dessert | Tags: bacon, blue cheese, caviar, eating snow, evaporated milk, Fiesta Friday, foraging snow, honey, lavender, snow, snow ice cream | Permalink.